Springtime is in full bloom and that means strawberry and rhubarb in endless wonderful, beautiful combinations. I’ve got a pie coming your way soon, but today I could use a cocktail. Rhubarb is hard to come by in Israel, so when I saw some at the market I snatched it right up and began contemplating the various ways I could put this tart stalk to good use. It’s a low-alcohol, easy-drinking, warm weather cocktail that goes down easy. It’s sweet and tart, but not in a way that will give you a headache (I don’t like overly sweet drinks), and has lots of brightness from the strawberry and lime juices. Don’t worry if you don’t have rhubarb bitters, although they add a nice herbal element and provide an extra layer of rhubarb. Seltzer finishes the drink and gives it that nice effervescence that I reach for in the warmer months. There are a few components involved in making this cocktail, but the rhubarb simple syrup makes enough for a number of cocktails, so do the work once and reap the rewards for weeks to come. Put the rum, strawberry nectar, simple syrup, and lime juice in a cocktail shaker with plenty of ice. Top with seltzer. Put 2 dashes of rhubarb bitters in each cocktail and garnish each with a strawberry. Put the sugar, water, and rhubarb in a small pot and simmer over low heat for 20 to 30 minutes. Remove from the heat and allow to cool (this will allow the rhubarb to steep further). Strain through a fine mesh sieve, pressing on the solids. Set aside the solids for another use (this is essentially rhubarb compote and is great on yogurt!). Put the rhubarb simple syrup in a clean glass jar and store in the refrigerator for up to 1 month. Put the strawberries in a food processor and process until liquefied. Strain through a fine mesh sieve, pressing on solids. Set aside the solids for another use (this is essentially strawberry compote and is great on yogurt!). Put the strawberry nectar in a clean glass jar and store in the refrigerator for up to 1 week. I dont know whats with rhubarb and strawberries but I love that combination. Another good pair with rhubarb is apples. I do too! I don’t know that I’ve tried rhubarb and apple but I’m sure I would love it! You know what’s also awesome? Making your own rhubarb-infused liquor. My old roommate made a bunch of rhubarb-vodka one year after our friend brought home a ton of it from her parents’ farm. 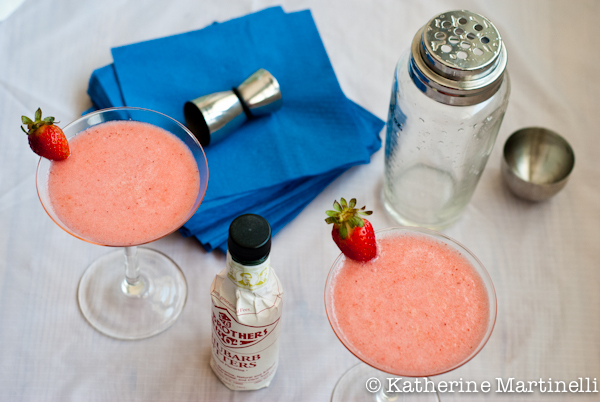 With some muddled strawberries and simple syrup, it made for a delicious cocktail. Oooh what a fantastic idea! Me too! I love the long season here – it’s been especially long this year! Oooh rhubarb with yogurt is just wonderful. You had me until you said low alcohol. Haha, kidding! Strawberry rhubarb pie, I hate. I think it’s a texture issue. But THIS I can do! We have several rhubarb plants growing in our garden so spring is rhubarb season in our house. Thanks for this recipe! Thanks!! So lucky that you have such an amazing garden. Oh, strawberry & rhubarb in a cocktail! Great idea. Sounds delicious. Love the top photo (but then, I’m a sucker for black backgrounds). Nice post – thanks. Thanks! Black backgrounds really do make cocktails pop. 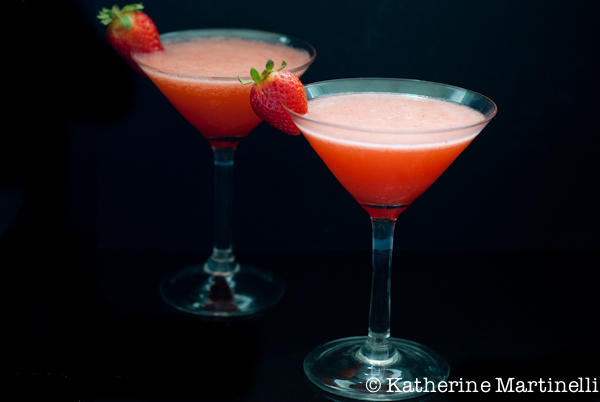 i love the idea of putting strawberries and rhubarb together in a coctail! sounds fun and refreshing! This does look perfectly refreshing! Very creative combination with the strawberries and rhubarb. Rhubarb in a cocktail is not found very much. Well done! The colours in this cocktail are gorgeous! I’m not much of a drinker but I drink and love fruity drinks like this one! I’ve never had this combination drink but I can already tell this sounds so refreshing and delicious! What a wonderful cocktail! I will certainly make it one day. I have also planned posting soon something with rhubarb. I have been buying tons of it for the last weeks! I love rhubarb. It is about that time right now and this looks so refreshing to sit outside and watch the sun go down. I can never get enough rhubarb in the spring. I love the idea of making rhubarb simply syrup and then this wonderful cocktail! Tasty, tasty drink! Awesome!! They’re such a natural pairing. I’ve been pretty addicted to rhubarb lately but have yet to try it in a drink! This looks so refreshing. The perfect spring cocktail! I’m not much of a drinker but I love strawberry-rhubarb combo. I can only guess how tastfull this cocktail is! Yes, yes, yes, dear god, yes! These look amazing…and my rhubarb plant is out of control to beat, so these are definitely going on the list. An out of control rhubarb plant? Lucky duck 🙂 Thanks Erina! I didn’t even know they made rhubarb bitters. But then again, with so many bitters on the market these days, I shouldn’t be surprised. A pretty cocktail to kick your shoes off with at the end of the day. Yes! Fee Brothers makes rhubarb bitters and they’re wonderful! There really are so many kinds out there these days. Thanks Carolyn! I absolutely love rhubarb and am so excited that rhubarb season is almost here. I’ve never thought of making a cocktail with it but I will have to try yours for sure! I love this cocktail! Strawberry and rhubarb marvelous together. I’m intrigued by the rhubarb bitters and will look for it – always fun to have a shopping mission! Thanks Hannah! The rhubarb bitters are fun and add a nice touch at the end. They’re probably available on Amazon if not a local liquor store. Fee Brothers makes them. Perfect for a hot summer’s day.